see UDPATE (Jan. 23, 2016). If you haven't already read our 4-part analysis on Iceman, then first do so here: Part 1, Part 2, Part 3 and Part 4. In Part 1 published in Sep 24, 2014, we have dealt with the extraordinary claim made by Michael Horn, which was that Meier had published the information on the cause of death (ARROW lodged in his back) of the 5,100 year old Iceman "mummy" which was unearthed high in the Austrian Alps in September 1991 before it was discovered. And since Meier, according to Michael, predicted and published this information in Semjase-Kontakt-Berichte volume 13 (SKB 13) in 1996, 5 years before the discovery of ARROW in Iceman's back by the scientists in the year 2001, he then must be given the $1,000,000 by James Randi because Meier has fulfilled James Randi's The Million Dollar Challenge on paranormal claims. As it turned out, in Part 1, we have shown that the text where it was supposed to mention ARROW in Meier's Contact Report 238, is missing in the SKB 13 (which we looked into) that was published in 1996 and purchased before the year 2000. At that time we have suggested that the scans (provided by Christian Frehner to Michael Horn in the year 2008) of the CR 238 text with the word ARROW which Michael Horn provided as proof of Meier's foreknowledge on his website then most likely have come about from a new edition that was published after the ARROW was discovered by scientists in July 2001. Fast forward to Feb 3, 2015 on which Michael published an article quoting the following excerpts from his correspondence with FIGU Core Group member and SSSC director Christian Frehner, which essentially supports our proposition that the word ARROW most likely have been inserted only after it was discovered by scientists in July 2001. “In the original contact 238 of November 9, 1990, on page 2018 (original) the information about the arrows is missing, just as it is the case in SWZ 79/11 on page 60. And also the date is wrong in both “places”: 4105 years2 instead of 5105 years. In the SKB Nr. 13 there’s something astonishing to notice: In my edition on page 2539, the one that I scanned for you, there’s the correct year (5105 y.) and also the information about the arrows, but in the version that is published on Mahesh’s site, the arrow information is not included. It’s a mystery to me. Perhaps the book was printed two times. I don’t remember, and I don’t have the brown SKB anymore. In the course of the production of the new PPKB Blocks, Ptaah, Florena or Enjana were correcting the old contact notes together with Billy and Bernadette, usually on Saturday afternoon each week, in order to correct as many transmission errors3 as possible (there were really mistakes in it due to the high-speed transmission). Therefore, in PPKB Block 6, on page 398, the ‘arrow information’ plus other minor corrections were applied to the text during that correction process. Regarding the publishing date of the Iceman information I would agree with Elisabeth Moosbrugger that the WZ 79/1 and 79/2 were published in autumn 19911 (certainly not before the Iceman was found), and possibly even at the time or a little bit after SWZ 80 was published.."
3 What are the chances that "errors" arise in the alleged telepathic transmission exactly with the pieces of crucial information that could have been the strong evidence for Meier’s foreknowledge (ARROW) and also results-in conveniently matching the incorrect scientific information (age of 4,105 years) at that time? Here we have FIGU CG member and SSSC director (Christian Frehner) himself acknowledging that even in the original document (in which Meier allegedly types for the first time and which forms the basis for the publications) on page no. 2018, the word ARROW is missing and was only inserted during the alleged correction process (very likely after the ARROW was discovered by scientists in July 2001). Also in the original document, the age of Iceman's corpse was given as 4,105 years which was later changed to 5,105 years in FIGU publications from 1996 onwards, 4 years after it was found out by the scientists. Christian ascribes these later insertions as a part of 'correction process'. Whatever the reasons and intentions may be behind these "corrections", if these are known to have been added only after they were found out by scientists, then it is totally misleading and a case of deliberate misinformation to still claim this Meier's 5,100 year old Iceman information as "specific, prophetically accurate scientific information" and as a “proof of a "paranormal claim” which is what Michael Horn is still doing, despite being informed by several people about these new findings. On the other hand, in his 2015 blog post, it now seems the only "scientific" evidence which Michael Horn is now using to promote Billy Meier's alleged foreknowledge on the Iceman information is Meier's "proven good character"! The accusation that Meier falsified information is a serious one, which should not be made without proof. We never made that accusation because one can't know for sure the motivations and intentions behind adding and altering the information which again in all instances was only published after it was first reported in the media by the scientists. So logically speaking, one can only state that first, the information Meier published combined with the publication dates doesn’t in any way prove Meier’s foreknowledge and second it even supports the null hypothesis, which is that Meier’s information regarding the ice man was based on terrestrial scientific information. But that doesn’t definitively PROVE that Meier falsified information. Apparently MH doesn’t understand these subtle but critical nuances. Impossible to "falsify" the text in CRs? In case of a forgery, he could not have known to which events he should refer in which contact report as it wouldn't have been possible to determine the free place for the supplements. All of the above reasons are faulty and contradictory. We already have addressed the major points on Billy Meier UFO Research (BMUFOR) website site here. To realize that the rest of the reasons are illogical we don't have to go any far. Let us look into the same Iceman information itself, which we are dealing with now. FIGU CG members and interested readers would always notice the falsifications immediately and voice their criticism if any manipulations were made at all to the prophecies/predictions or scientific information in the contact reports? We have at least two FIGU CG members (Christian Frehner and Hans Georg Lanzendorfer) and American media Rep. for Meier case, Michael Horn who have published corroboration articles on Iceman information published by Meier. Yet they (including several others) who have direct or indirect access to the various editions, either failed to notice or kept silent about the obvious differences in the Iceman information published in various publications until we have published it for the first time through our analysis. How could Meier accomplish this "highly improbable and quite impossible" feat without anyone finding it out? Apparently it is very easy to accomplish this task of making changes to CRs. If they have failed to notice this, how many else have they failed to notice so far? We have documented many such examples (corrections or falsifications?) in our investigation into the prophecies and predictions, which soon will be published. For now check out this example - MUFON prediction. One likely reason for their failure to notice the obvious differences over different editions is due to the confirmation bias - a tendency to see and interpret information in a way that confirms one’s preconceptions. In the future, we will discuss this topic in much depth on BMUFOR. ... Look here, this article has been in the newspaper. It is about Urk. (Note . : See Plejadian-Plejaren contact reports, Block 6, 238. Contact, Saturday, May 18, 1991, page 397 et seq.). 9. That’s the real truth regarding Urk’s death. Probably the hiker was attacked from an ambush, an arrow pierced the left shoulder blade. Recent computer tomography images of the chief pathologist at the Bolzano Central Hospital, Eduard Egarter Vigl, show that the arrow tore up vital blood vessels. The physician is convinced: the victim only lived at most one to two minutes. But who was Ötzi? The spectrum of hypotheses stretches from an ambushed shepherd to a tyrant, who was assassinated by his clan. The latest variant comes from the flint specialist and former chief geologist of the Ötzi-project, Alexander Binsteiner: There are many indications that the iceman was a copper prospector from the south, one who took care of the supply of the desired metal from north to south and the technology transfer from Upper Italy to the Northern Alps. And he was clearly not travelling alone. Because as the latest CT images show, the wooden shaft of the arrow has been carefully drawn from the wound. Binsteiner’s explanation: <Ötzi> wasn’t capable to do that anymore. And it could also not have been the offender, because he would have certainly taken the valuable equipment. So the only possibility that remains is companions who successfully could fend of the attack and then buried the dead (man) in sleeping position and with his personal possessions. The way it was customary at that time. It is remarkable that the scientists now came up with the idea that Urk wasn’t alone and that a raid or something has taken place. It seems to me that our contact conversations have played a decisive role, which mention that Urk was travelling with 13 companions and that all of them witnessed a fight to the death between two other rival groups, which resulted in a number of deaths. It seems very suspicious to me that those who research Urk now suddenly pick up on our discussed facts and mention that Urk was not alone. Very remarkable. 5. Indeed, to me it also seems remarkable that it is now mentioned Urk wasn’t alone. Another question about this: Why was only Urk’s corpse found on the Similaun Glacier, as several people lost their lives there? How many were they in total? Do you know that? 6. Apart from Urk, the number of dead was another six. 7. The bodies were indeed slightly covered during the ice storm, but they were taken away later, and indeed before they were dragged away by mountain animals and could have served them as food. 8. Only Urk’s body was left untouched by them because his companions left him and simply buried him under ice floes, so he was spared from the predators. So that is how it was. What does CR 451 state? In CR 451 (2007), we have Meier referring to CR 238 (1991) and also quoting excerpts from CR 347 (2003) along with an article published in STERN magazine No. 22 from May 24, 2007 which Meier gives to Ptaah to read. After reading the STERN article, both Meier and Ptaah strongly suggest that the "facts" regarding Urk/Ötzi published in the aforementioned contact reports would have been picked up by the scientists after reading them. What are these "facts/ideas" in the CRs which scientists have picked up and which played a decisive role in their research, according to Meier/Ptaah? How did Meier/Ptaah connect the above "facts" from CR 238 and CR 347 to the information in the STERN article? Ötzi was incapable to remove the arrow that was lodged in his back, by himself. So there must be at least another person to remove it. Ötzi's valuable equipment and his personal possessions were found at the site near his corpse, which would have been taken away by the attacker if Ötzi was alone. So there must be companion(s) who must have fend off the attacker(s) and secured them. Ötzi's corpse was found in a sleeping position with all of his personal possessions nearby, suggesting a burial tradition of that time. How could reading Meier's texts on Ötzi having 13 companions lead scientist(s) to propose that Ötzi might have companions ? Meier didn't mention what happened to the remaining part of the ARROW, whose arrowhead was lodged in Ötzi's back. Was it broken when Ötzi fell from a height (CR 238, v. 574 and CR 347, v. 8)? Or was it removed by one of his 13 companions? Why is this part of the arrow not been found at the excavation site? This information is totally absent in Meier's CRs which otherwise in theory (however improbable) could have been argued as "decisive" for scientists. According to Meier, there was no attacker behind Ötzi's death and the actual reason for his death is due to a fall on his back from some height (due to an epileptic fit) during which he was severely injured by his own ARROW. This contradicts Alexander's 2nd reason which requires an attacker for his companion hypothesis. The burial hypothesis proposed by Alexander was published in STERN magazine in May 24, 2007 which is 20 days earlier than the alleged meeting that took place between Meier and Ptaah (CR 451, June 13, 2007) in which Ptaah/Meier for the first time* mentions that Ötzi was buried by his companions. So in this case how can Meier/Ptaah claim that scientists likely have picked up the 'buried by companions' idea from the CR 451 when the alleged contact hadn't even took place and the conversation documented and published? CR 451 was for the first time published in Semjase Kontakt Berichte 2nd ed. Vol 22 (SKB 22) in 2008 and later in PPKB 11, 2010. 572. The next thing will happen in the Oetztal Mountains, on the Similaun glacier. 577. The storm covered the mountains under (a) thick (layer of) ice, and in it the corpse of the “fallen one” remained mummified and preserved until today.. 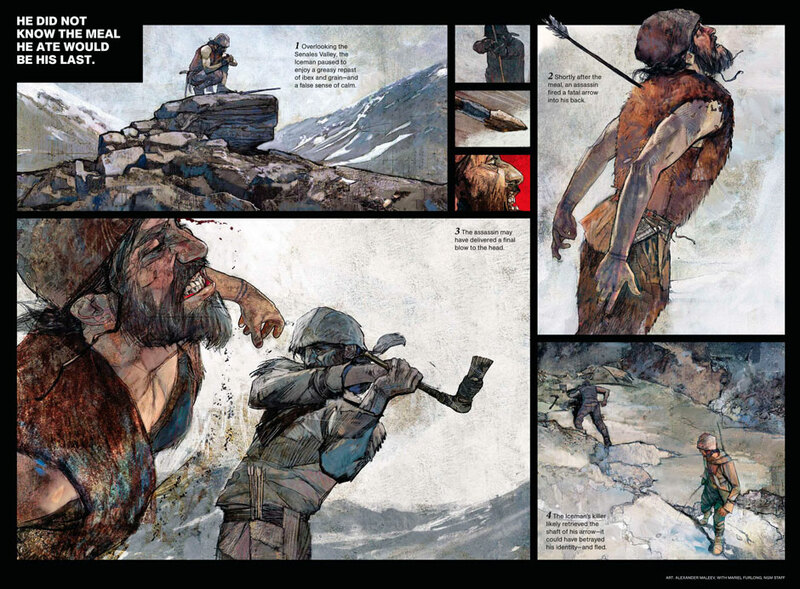 The above text clearly indicates that just at the moment when Ötzi fell and suffered a fatal injury (by his own ARROW that pierced into his body), a "primeval ice storm" started from which the 13 remaining persons were "fully occupied" with saving their own lives and they "did not care" for Ötzi. Fast forward to 2007 (CR 451), apparently after reading the STERN article containing the burial hypothesis, we then have Ptaah/Meier mentioning that Ötzi was carefully buried by his companions which is why his corpse was not ravaged by the mountain animals which usually feasts on the corpses. This clearly contradicts the earlier information from CR 238 and CR 347 (green-colored text). This adds further support to the null hypothesis which we already have pointed out in Part 3 and Part 4, which states that Meier/FIGU would use the contemporary scientific theories or opinions published in the media (newspapers, magazines, TV,..etc), as the basis for their publication of the information in CRs. Is there any evidence to support the burial theory? Alexander in his 2007 STERN article, just proposed a few reasons as to why Ötzi could have been buried. But there were already other valid theories at that time that could explain most of the evidence. For example, one theory (see Part 4) alternative to the burial hypothesis states that the attacker removed the arrow shaft (which is missing at the excavation site) from Ötzi's back because he must have also belonged to the same tribe and hence doesn't want to leave behind evidence (arrow shaft) that could lead back to him. Due to the same reason he also didn't want to possess Ötzi's equipment and his personal possessions as this would clearly indicate his role in Ötzi's murder. It was also said that since Ötzi was found with his left arm appear twisted across his chest, which is unnatural and doesn't resemble any culture's burial tradition, he couldn't have been buried. "Vanzetti’s scenario, which has already been discussed numerous times in the past, displays fundamental weaknesses in its chain of argument and its archaeological context, however, meaning that his theory cannot be accepted by the majority of researchers into the Iceman." "The arguments of Vanzetti et al., hypothesising a burial on the glacier, are therefore unconvincing both from an archaeological as well as from a biological point of view." ""He (Ötzi) felt safe enough to take a break, and settled down to a copious meal. While thus resting, he was attacked, shot with an arrow and left for dead." There was no evidence pointing to a possible burial as some scientists have suggested in the past. "The position of the mummified body with his arm pointing obliquely upwards, the lack of any piles of stones or other features which often accompany burial sites, runs counter to the burial theory,".."
Regarding the Claim B, Alexander Binsteiner in the 2007 STERN article mentions that the Iceman and his companion(s) probably were ambushed. But this ambush/attack theory (with only Iceman) was first proposed by the scientists when an arrowhead that caused the fatal injury was discovered in Iceman's back in July 2001, 6 years before the alleged meeting that took place between Meier and Ptaah (CR 451, June 13, 2007). Even in CR 347, Meier mentions Ötzi witnessing a battle to the death between 6 human beings of two rivalling groups or tribes, which was disclosed only after these incorrect conclusions (see Part 4) were first reported in the media at least by Aug 14, 2003, 5 days before the alleged meeting that took place between Meier and Ptaah (CR 347, Aug 20, 2003) and 4 years before CR 451. Again it is inconceivable to even imagine how scientists could arrive at their conclusions based on Meier's data from CR 347. Text from the CR 238 (1991) unambiguously states that he was "original Swiss" and came from the "banks of Lake Zurich", which is a lake in Switzerland, extending southeast of the city of Zürich. Even the FIGU Core Group member Hans George Lanzendorfer published an article titled - Gletschermann URK, Häuptling der Suren vom Zürichsee Oder: Wer suchet der findet (Iceman URK, Chief of the Suras from Lake Zurich Or He who seeks will find it) - in Stimme der Wassermannzeit Nr. 88, September 1993. In this article, Hans presents his extensive research (even citing "corroborative" information from Meier's CR 240, Dec 30, 1991) in narrowing down the homeland of Iceman and concluded that he must have come from either Männedorf-Surenbach (one of the pile-dwelling sites at Lake Zurich) or from other settlements in the same area. In Part 3, we looked into the above information on the location of Iceman's homeland published by Meier/FIGU and pointed out that it was proven false by a 2003 study that establishes that the Iceman was from Italy, which lies to the south of Switzerland. As it turns out, early this month (Feb 3, 2015) after more than two decades it has been reported by Christian Frehner that the Iceman actually was not originally from Lake Zurich region in Switzerland but from the southern regions. If these "southern regions" include Italy, then this can be said to be another example that strongly supports the null hypothesis which states that Meier/FIGU would use the contemporary scientific theories or opinions published in the media (newspapers, magazines, TV,..etc), as the basis for their publication of the information in CRs.